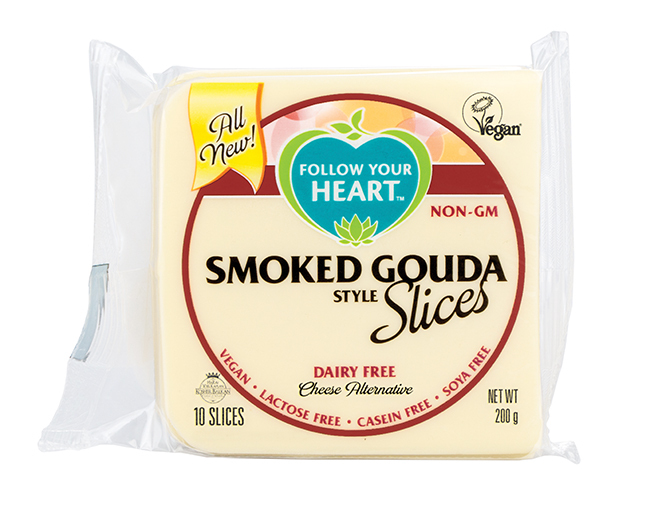 From the moment you open the packet, you know this is a good version of a smoked gouda – we think it could even be mistaken as a non-vegan version. Made from coconut oil, potato starch and vegan natural smoke flavouring, it has a delicious burnt wood aroma, a smooth, ever-so-slightly rubbery texture and a very creamy flavour. As it comes in slices, this is definitely one that is good to use in a sandwich, but also tastes great melted in a toasty or added to a burger. It has a stronger flavour than many vegan cheeses, and will definitely delight anyone who used to be partial to smoked applewood. Searching for the perfect cheese to melt on your pizza or top beans in a comforting jacket potato? You won’t go far wrong with this version from Bute Island Foods. 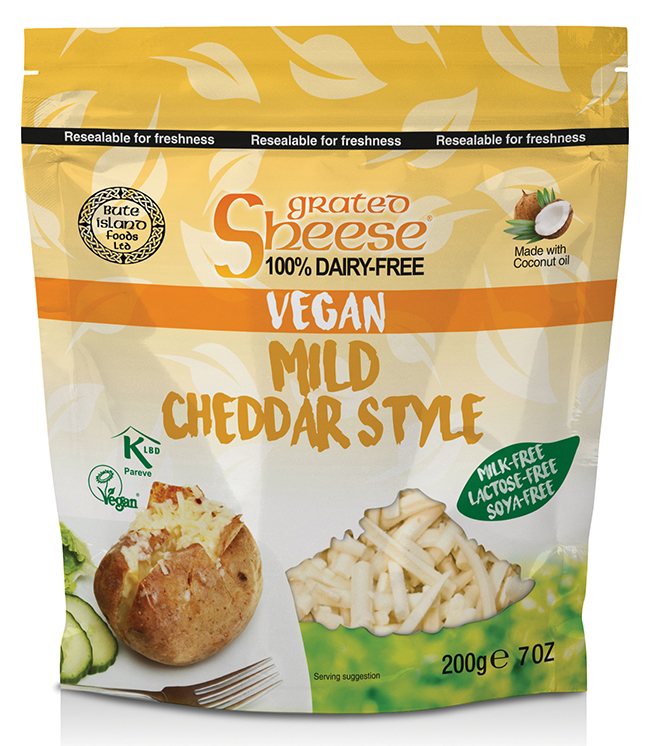 The grated cheese is available either as mild Cheddar, mature Cheddar or mozzarella, and it melts just like dairy cheese to give a really even coverage and doesn’t bubble as much as some of the other vegan cheeses on the market when heated. The flavour is mild, but works well when combined with a rich tomato pizza sauce, and it does have a slight tang of its own. Although it’s made with coconut oil it doesn’t have a cloying taste, it just helps with the meltability. It’s also worth pointing out that Bute Island is also the producer behind Tesco’s own-brand free-from cheese, so if you can’t find the Bute Island versions, just pick up the Tesco ones! 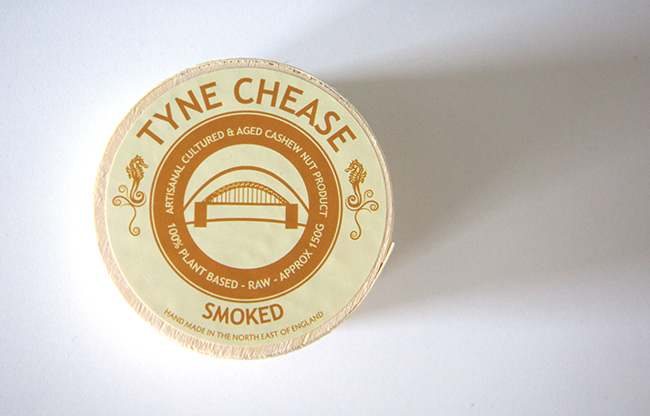 If you miss having cream cheese on crackers, or lashing it onto your jacket potatoes, this is the one for you! 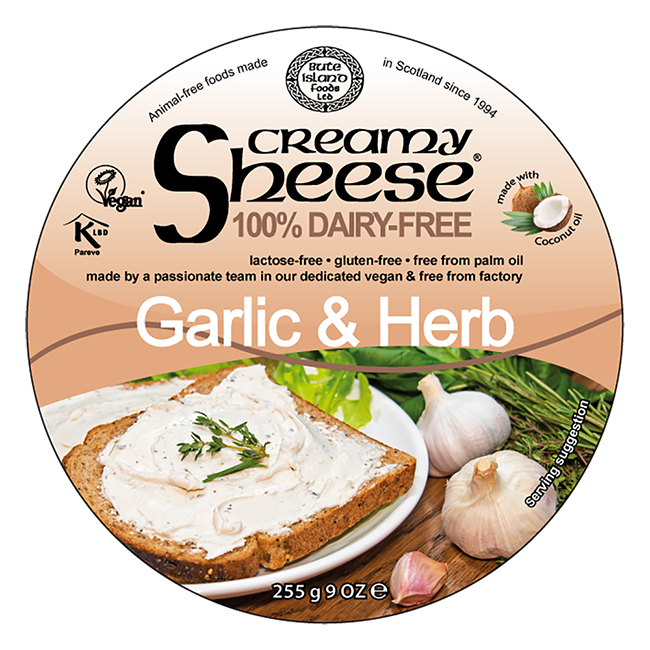 Incredibly rich, smooth and creamy, this variety packs a real punch with its added garlic and herb flavourings. Like many vegan cheeses, it’s got a coconut oil base, which accounts for the smooth texture and the flecks of green herbs look pleasing to the eye. It has a bit of an aftertaste, so the garlic will keep the vampires away. Spread onto toast, stir into mashed potato to liven it up a little or make a simple supper by stirring it into some pasta for a lovely creamy sauce. 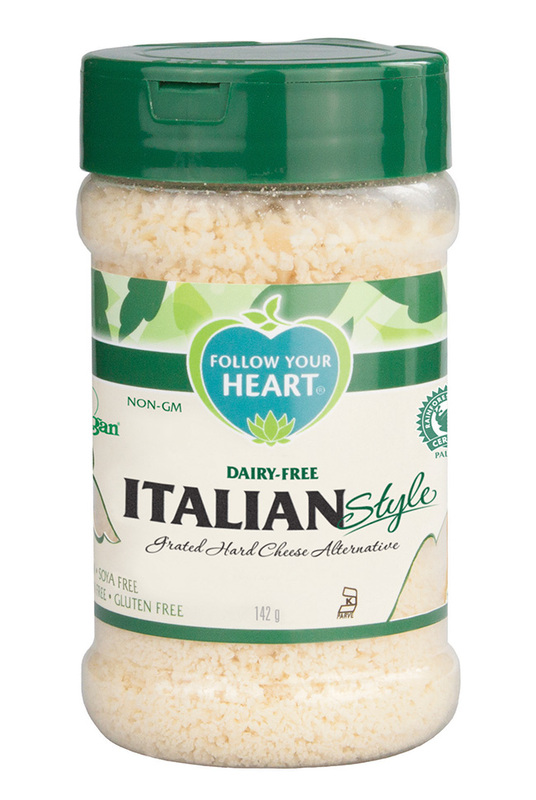 For many, pasta just doesn’t taste quite the same without a sprinkling of Parmesan on top, so if you’re really missing the Italian hard cheese, get your hands on a tub of Follow Your Heart’s version. Nutty to taste with a good salty hit, the texture is quite grainy, so close to the original, and it’s helpfully already grated for you, so you literally just have to sprinkle and go! There’s a mild tang from the chickpea miso used, which makes it really nice when you allow the flavours to shine on their own too – so as well as adding it to your pasta, why not sprinkle over griddled vegetables like asparagus, or add to your salad for an indulgent edge? The options are endless. This cheese will wow on the cheeseboard with its vibrant burnt orange colour and lovely round form. Completely different in flavour to the Follow Your Heart smoked cheese, smoked paprika adds a real tang to this version, which almost has a tomatoey edge. The texture is squidgy and feels substantial, and is perfect for eating on a cracker alongside a nice glass of wine at the end of a long day. 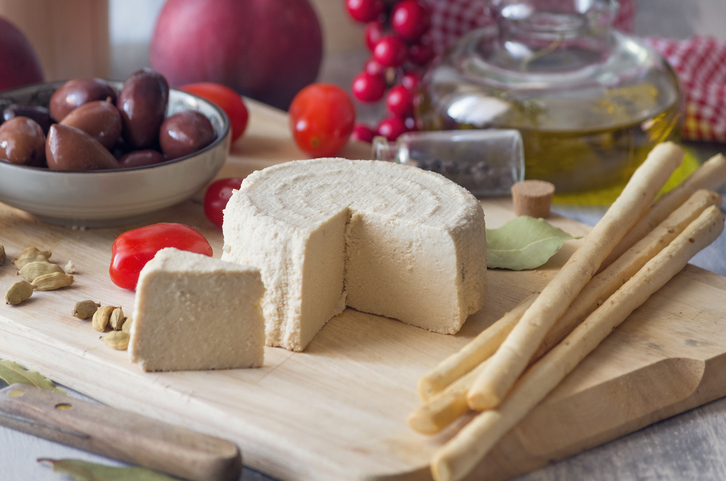 It’s made from cashew nuts and probiotics, and follows the more artisan method for making cheese than some of the larger brands. Definitely a cheese with character. 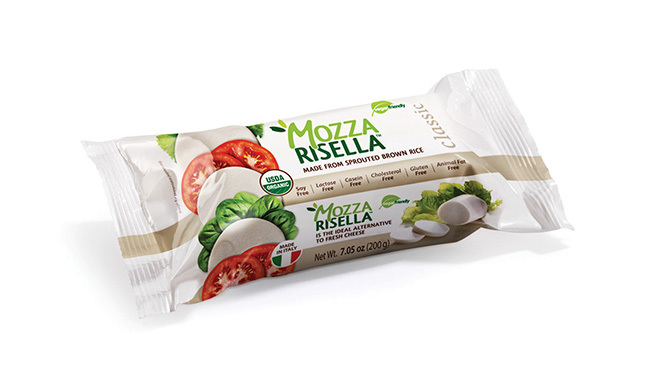 If you’re missing buffalo mozzarella, this is the choice for you. Soft and slightly squidgy in texture, it is a lovely option for recreating the classic Italian insalata Caprese, with slices of the cheese layered between sliced fresh tomatoes and plump basil leaves. The cheese tastes quite herby itself and is packed with flavour, making it great for eating on a cracker, but it can also be melted on a pizza or into a pasta dish. This is the brand that chain restaurant ASK is currently using on its vegan pizzas. Unlike most of the cheese on the market, which is based on coconut oil, this is made from whole Italian rice germinated with Dolomiti spring water. Delicious. 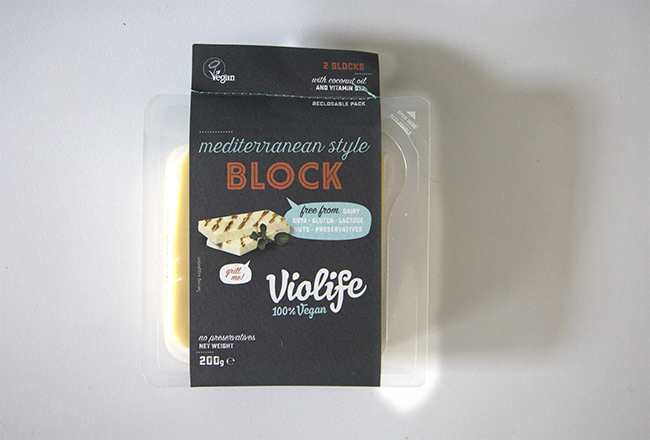 The news of Violife’s Mediterranean Style Block (AKA vegan halloumi) was much awaited and it was met with mixed reviews. It’s best prepared by lightly grilling it to give it the characteristic slightly rubbery texture that you’d expect from halloumi, and the firmness makes it pleasingly more substantial than some cheese on offer. If you’re expecting the salty flavour of halloumi you’re going to be disappointed though. More like a Cheddar, it’s definitely lacking in saltiness, but it does still work well in salads, or even melted on a vegan burger. It’s not your classic halloumi that’s for sure, but still worth a try. Check out part 1 of our cheese taste test series here.